A 22-year-old woman from Mexico’s Tarahumara indigenous community has won a 50km (31 miles) ultramarathon wearing only sandals. She ran without any professional gear, and her pair of sandals was reportedly made from recycled tyre rubber. The Tarahumara are notorious for being excellent runners. Apart from the sandals, she wore a skirt and a scarf in the race. The runner did not have any professional training. She finished the race at seven hours and three minutes, and was awarded 6,000 pesos ($320; £250). Reports said her job is herding goats and cattle, walking some 10-15km every day. 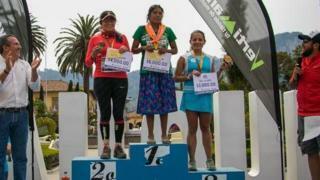 Last year, she came second in the 100km category of the Caballo Blanco ultramarathon, in Chihuahua.